iFollow is an online streaming service that is used to watch games from lower-tier categories in England, such as the Championship, League One and League Two. Users can access this service without a cable/satellite TV subscription, since they can pay to watch a single game or to watch the full season with the annual package. Broadcast rights are renewed each year, with games for each category being determined alongside the network that owns TV and online rights for all of these categories (Sky Sports). 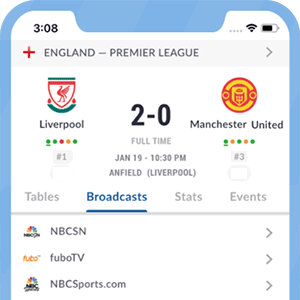 This service works side-by-side with all the clubs, since they provide updates to their fans about which of their games will be broadcast on this platform, both online and via mobile apps and services. *Got itLive Soccer TV does not provide iFollow live streaming. The information provided on this page is simply iFollow soccer TV schedule. Up to 46 live matches for each of the following Championship clubs: Barnsley, Bolton Wanderers, Brentford, Burton Albion, Cardiff City, Ipswich Town, Millwall, Norwich City, Nottingham Forest, Preston North End, Reading, Sheffield Wednesday and Sheffield United.